The Jeffer is now one of only 3 drivers at the historic Orange County Fair Speedway to notch 50 career big block modified wins! The Jeffer took advantage of a late race restart to power to the lead and then cruised on for his 50th modified and 71st total victory at “The Hard Clay!” Thank you to everyone who made this win possible and especially to our car owner Ronnie Roberts! “The Jeffer” Jeff Heotzler will be inducted into the Northeast Dirt Modified Hall of Fame this August as part of the class of 2016! WEEDSPORT, NY – Billy Pauch, one of the region’s winningest and most versatile modern-era drivers, longtime Orange County and Accord kingpin Jeff Heotzler and pioneer Southern Tier legend Don Diffendorf will officially be inducted into the Northeast Dirt Modified Hall of Fame in August. These three driving greats add their names to a stellar list of Modified standouts that was started in 1992 when the Hall of Fame was established on the Cayuga County Fairgrounds in Weedsport, New York. The 25th annual induction ceremonies honoring the Class of 2016 will take place Monday, August 8 at 7 pm in the Northeast Dirt Modified Hall of Fame and Museum, on the grounds of the renovated Weedsport Speedway. The following evening, Weedsport Speedway will present its Super DIRTcar Series Hall of Fame 100 for the big-block Modifieds. Although Jeff Heotzler’s 11 championship titles at Orange County Fair Speedway and Accord will always tie him to those tracks, the Wallkill, NY, driver stacked up some pretty impressive scores over the years outside his familiar home turf. Heotzler was named Mr. DIRT 320 Modified series champ in 1984; he won the inaugural Syracuse small-block race, the 2007 Eastern States 200 at Orange County, and back-to-back Eastern States small-block Mod 100s in 1988 and ’89. He owns a pair of wins in Lebanon Valley’s prestigious Mr. Dirt Track USA championship big-block event, and another deuce in the Valley’s Race of Kings for SBMs. Since 1978, when he first strapped into his brother’s coupe during a hot lap session at Orange County, “The Jeffer” has notched nearly 150 wins at 13 tracks from Florida to Quebec. The defending Accord Mod champ, age 58, is in his 39th year of competition. After rebounding from last to 6th in 10 laps after a right rear flat tire on lap 38 of 50, The Jeffer cut down another tire, this time with only 2 laps to go. What would have been a strong start to the Short Track Super Series, turned in to a disappointing outing aboard the Roberts Racing 14h. A scoring blunder recorded The Jeffer as 2 laps down, however, the team is challenging the official rundown as the 14h never went down a lap under green. His 2 pitstops occurred under yellow, which happened to take place on the same laps several other drivers pitted, who were all scored on the lead lap. WALLKILL, NY (JHR – March 2nd, 2016) – “The Jeffer” Jeff Heotzler, the ageless talent from Wallkill, NY, will be hitting the road and chasing the money in 2016. The 58-year-old pilot had a successful 2015 campaign that produced 4 victories, a track championship and a 4th place finish in the highly competitive Short Track Super Series. Heotzler’s 5th career Accord Speedway triumph was his first title at the ¼ mile bullring since 1986, further cementing his incredible longevity in the sport. Despite the accomplishments, The Jeffer finds himself without a full-time gig for 2016. Longtime driver turned car owner, Mel Schrufer, who provided the opportunity for Heotzler to pilot the potent 2a small block modified in 2014 and 2015, sold his operation at the end of last season. “It was an absolute pleasure to get to know Mel, his family and crew. The two years we spent together were a blast and I am grateful to have had the opportunity to wheel the 2a,” said Heotzler. With the scarcity of car owners in today’s racing climate, Heotzler and his son, Jeff Jr., decided to resurrect the Jeff Heotzler Racing (JHR) J17 and aim to compete in select higher paying shows along with the entire Short Track Super Series North schedule in 2016. The JHR team will be debuting a brand new Teo Pro Car with a small block power plant which they hope to have readied for the STSS opener at the Orange County Fair Speedway. In addition to the JHR 358 modified, The Jeffer will once again have the Ronnie Roberts’ owned 14h big block modified in his arsenal for this season. Heotzler hopes to compete in select big block events at OCFS, Rolling Wheels and visit the Roberts Racing team at their home track, Bridgeport Speedway, throughout the course of the season. “Ronnie and Fay have been nothing but generous to me since day one and I cannot thank them enough for continuing to provide me with an opportunity to drive their top notch equipment,” exclaimed Heotzler. The Jeffer has scored 2 victories at OCFS in the Roberts 14h and put forth a valiant effort in last year’s Eastern States 200, where a cut tire while running 3rd with under 10 laps to go cost him the opportunity to battle for his 2nd ESW 200 crown. The Jeff Heotzler Racing team, comprised primarily of Heotzler, Jeff Jr., and longtime crewman Bobby Vincent, is eager to get 2016 underway. 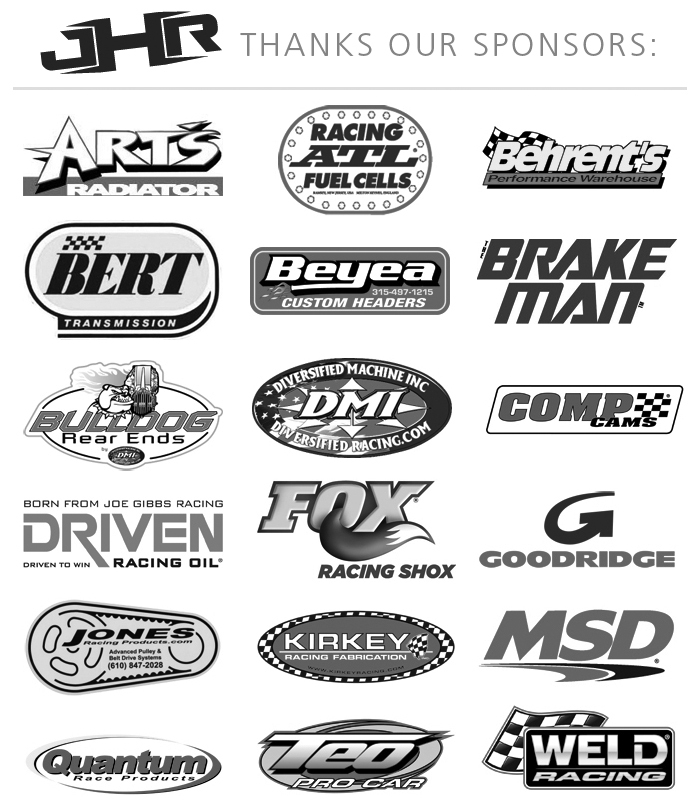 Marketing partners are always welcome and are pivotal in ensuring that JHR can reach its full potential. To contact Jeff Heotzler Racing, please call 845-863-7351 or email Jr@JeffHeotzler.com. More information on The Jeffer can be found on the team website, www.jeffheotzlerracing.com or Facebook page, https://www.facebook.com/JeffHeotzlerRacing/. Now that the season is officially over, we’d like to thank everyone who made 2015 both a possibility and a great success. We’re grateful for the opportunity to drive fast race cars and to be surrounded by even better people. If we keep winning, we’ll keep coming back… So see you again in 2016. Thank you again. Jeff Heotzler, 14h, battles Brett Hearn, 20, during the 2015 Eastern States 200 at the Orange County Fair Speedway! Jeff Heotzler and the other leaders of the 2015 Eastern States 200 on a restart. “The Jeffer” Jeff Heotzler buckles in for the start of the 2015 Eastern States 200 at the Orange County Fair Speedway! Jeff Heotzler battles Tim McCreadie in the Eastern States 100 at the Orange County Fair Speedway! “The Jeffer” Jeff Heotzler during 358 Modified Time-Trials at the Orange County Fair Speedway! “The Jeffer” Jeff Heotzler during Modified Time-Trials at the Orange County Fair Speedway! Jeff Heotzler and Tommy Meier battle for position during the Eastern States 200 at the Orange County Fair Speedway! “The Jeffer” Jeff Heotzler before the start of the Eastern States 200. Jeff Heotzler and Mike Ruggiero battle for position during the Eastern States 200 at the Orange County Fair Speedway! Just as things started to look up at the Moody Mile, disaster struck in the triple 20 as driveshaft in The Jeffer’s 14h let go, ending his and the teams hopes of making the final 200 at the historic speedway. We thank everyone who made the trip a possibility. Although it still stings, we are thankful just to be apart of the event. Later that night, The Jeffer headed to i88 Speedway to pilot the Schrufer Racing 2a in the final race in the Short Track Super Series. After winning the heat race, The Jeffer headed to the redraw, picking the 8th starting position. The Jeffer advanced into the top 5 early, however, he was involved in a tangle which sent him to the rear of the talented 26 car field. From then restart, The Jeffer put on a driving clinic, using the bottom lane to perfection, and with 5 laps to go was hot on the leaders tails. He was able to slip into 4th place on the final circuit and by doing so, captured 4th in the overall Short Track Super Series North Standings! We’ll see you all at OCFS’s Eastern States Weekend! It was a night to remember at the Accord Speedway. The Schrufer Racing 2a was flawless all season long thanks to a tremendous group of people who made it all possible. To cap off the night, Jeff Heotzler Jr. scored his very first modified win! The Jeffer and the Schrufer Racing 2a team had another strong performance on Friday at the Accord Speedway, finishing a close runner-up after starting the 30 lap feature from the 5th row. With only 1 week left in the championship point chase, The Jeffer holds a 24 point advantage as he looks to capture his 5th Accord modified crown. We hope to see you all next Friday at the “Big A” for Champion’s night! The Jeffer continued to his consistent ways at the Accord Speedway on Friday night. He won his heat race in convincing fashion and later rolled off the starting grid for the 30 lap feature in 9th. He patiently clawed his way forward on the bottom of the race track, and with less than 5 to go, broke into the top 5. When it was all said and done, The Jeffer and the Academy Transmission 2a, took home a solid 4th place effort. There are only 2 more point races left at Accord and The Jeffer remains in the lead. He will need to continue his consistency to secure his 5th Accord Speedway Championship.